Initial Reaction of Book in One Word: WOW. The Impossible Knife of Memory will stab you like a knife--in a good way, of course. And to think, I almost didn't read it (at least not at this time). Which is why I am telling you, yes you, to read this book (and to the people who told me to read it, thank you). I can't think of a complaint for this book. I'm trying to think, trying to find something, and I'm coming up blank. The story was compelling and beautifully painful and just done so well. (I hesitated to read this because it's not a light and fluffy book. This is your more serious, deep contemporary YA. But after seeing the reviews and the comments, I just gave in and read it, and thank gosh I did.) This book is totally devourable; I read it over the course of one day, one single day, and I rarely ever do that. I was sucked into this so quickly, and before I knew it I'd read ninety pages. And it all flows so well and it just WORKS. Heck, this is the second book I've been finished this year and I'm already thinking it could be one of my top ten favorites of the year. And the writing, oh, the writing. I've read Speak and Fever 1793, both by Laurie, but I read them forever ago, so I don't remember too much. 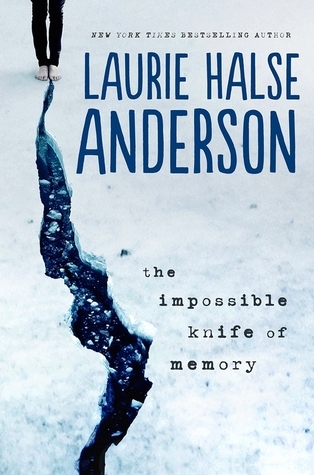 But sheesh, after how The Impossible Knife of Memory was written, I want to read all the Laurie Halse Anderson books. Her writing is kind of like poetry, and I just LOVED it. And the voice she conveyed was just fantastic. There's a reason almost all of her books get at least one starred review. I mean, I was bummed when I got tired (started the book after midnight) and had to put the book down, and bummed again when I had to leave the house, because I couldn't read the book, and that's really all I wanted to do. The characters, even though they may be a little bit broken, were wonderful. 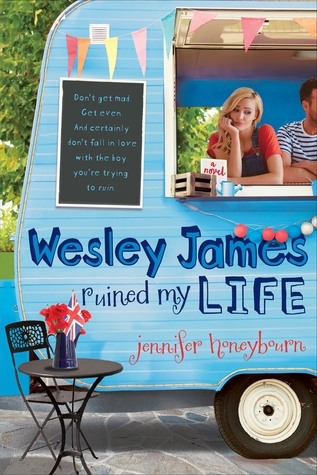 As my friend Holly said on Goodreads: "The characters are so relatable even if this is not the situation one's in." And I completely agree, because YES, that's IT! When reading the book, I felt this sort of connection with the characters--for sure Hayley--even though we had so many differences. I loved that. And speaking of Hayley, she was a fantastic MC/POV. Even though her life is pretty crappy and she babysits her time bomb father, she acts tough and still tries to hold her head high. I know this isn't the kind of book to have a sequel, but I would so read more from her POV. And her father, Andy, the poor soul. I don't even know what to think of him (and I don't want to spoil the book). Being in the war definitely left its mark on him, and he's suffering. It was interesting (not the best word choice) to see the story of a teenager living with her father who has PTSD. I liked Ms. Benedetti (funny story: my high school had a guidance counselor of the same name), Trish, and Gracie and Topher. And there's Finn. Finn Finnegan. Finnegan Trouble Ramos. He's so swoony. The personality on that boy is so great, and some of the things he does are just UGH. (Seriously, he does one of the Cutest Things Ever. If you've read the book, you know what I'm talking about.) His personality coupled Hayley's somewhat harsher one was an excellent match-up, and he helped lighten the book. I hope I put everything into this review that I wanted to, but I'm sure I forgot something(s). I don't know what else to say. That this book was phenomenal? Divine? So good? In all honesty, I thought I would at the most like this book, but I didn't think I'd like it this much. The writing and voice helped make it, but this book has quality. And I fear that, due to its subject matter and it being a darker sort of book, it might slip under the radar a little bit. (But maybe not. This is Laurie Halse Anderson, after all.) But I don't care if you're afraid of deeper, more serious books. Get over it. I did. Because this? This is literature. And a damn good book. Would I reread it? It's not unworthy of a reread, but with the depth and all, I'm not sure that I'd read it again. But I might. With the writing and voice and everything, I might. Would I purchase it? Laurie's coming to town, so I was already planning on doing so (and I'm excited to own a finished copy)! Who would I recommend it to? Let's just say everyone, yes? So so happy you gave this a try. I totally agree about how relatable the characters were, even though the situation wasn't. It was my first LHA book and I went out and bought Speak and Wintergirls as soon as I finished it. Hayley was just brilliant as a narrator for me. Her anger and resentment was so understandable given her situation and every good moment between her and Andy made me choke up so hard that I could hardly speak. She really knows how to create an emotional scene, without going overboard. And I think one of my favourite things was that Hayley and Finn didn't get together at the end. Finn became a support for Hayley when she really needed it. And the focus was more on her and her dad! I'm so glad to hear another extremely positive review! I've been so excited to read this book since...well, it feels like forever! I've read a few of LHA's books, and I'm glad she tackles issues that many others are afraid to even talk about. With so many people saying good things about this book, how can I not put it into my wish list? Thanks for the review.